This June will be our tenth anniversary. Of course, we would love to celebrate it with a little trip. Just the two of us. B has her eyes set on the Type A Parent Conference. While that conference intrigues me as well, I have to admit that it isn’t what I picture a tenth anniversary trip to be. In my mind, we would drop the kids off at B’s parents and head somewhere just the two of us. In my mind, it would be somewhere within driving distance and lasting just the weekend, yet somewhere that we wouldn’t go if NHL and JSL were with us. Specifics, though, elude me. 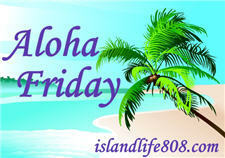 My Aloha Friday question for today is: Where would you go on a tenth anniversary weekend retreat? A nice B & B somewhere that you can take walks or just sit by the fireplace. Happy upcoming anniversary! Hmmm… mine is coming up in March. Since we have little kids, I would say if we can get out on our own I would be thrilled. Maybe a nice B&B? But, I would take dinner and adult conversation. Beth and I talked about this so….I have to agree with her and Type A Conference. Upgrade your room with a few romantic amenities…fireplace, hot tub…and spend more time alone than usual! Just saying. We will be celebrating our 10th on June 9th. We would most likely have done a cruise but this year we will be celebrating it in our new place we will be calling home, Japan! I would go to a nice hotel if I could not go far. If money (and time off) were no object, we would probably go on a week-long cruise or something. (Either Disney Dream or an Alaskan cruise.) However, with DisneySMMoms coming up in a couple of months, I won’t have the days off and we just can’t afford a long getaway like that. Hmmmm, good question – I want to go on a cruise at some point but more over around Europe so that may be more of 20th anniversary….i guess just a nice place to retreat to, like a b&b or something. Ideally I would go back to the Dominican Republic and relive our honeymoon….that is not likely to happen though! We’ve actually talked about doing a trip to Europe for our 10th anniversary, it coincides with a 5 year sabbatical my husband will get from his work and would just be a real dream come true do it someday, if not for our 10 year anniversary, definitely a future one. In Ontario, we have Niagara Falls, but, go up the road a bit and there is a lovely community called Niagara on the Lake. Great wine and theater. That is where I would go! Any where without kids has to be a treat! Just saying. How about we look into one of the weekend cruises out of NYC up to New Brunswick? Of course, I would prefer TypeACon and/or a Disney Cruise.